SERVED: Are you a hard-working actor, studying the craft, auditioning left and right, wondering if this stress is worth it? Well it's probably not because it seems the only way to get hired nowadays is for your dad to produce a movie and let you star in it. Last year, Will Smith produced a remake of the 80's classic The Karate Kid and cast, of course, his son! Because why audition any other talented kids? Now with younger sister Willow's burgeoning music career it's time for daddy to buy her a movie (so says the word on the street): a remake of the classic musical Annie. F NO. Is nothing sacred? Can't a legendary movie just remain a classic and not get re-made and ruined 10 times over? Annie holds a spot dear to my heart and I'd rather not see some Jay-Z scored hip-hop remix of a super-rich-bazillionaire child pretending to be an orphan. 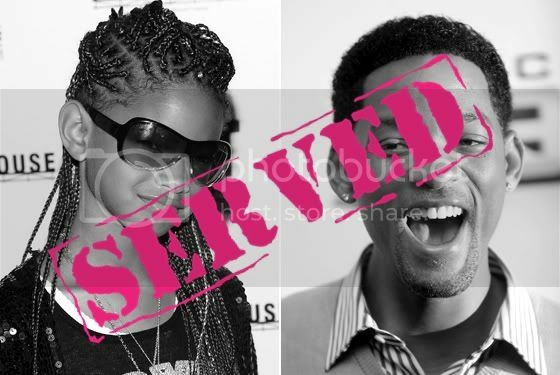 Will Smith and child, you are SERVED by me for taking a classic and ripping it to shreds just to have a vehicle for your daughter. Here's a novel idea: write an original script and stop remaking every children's movie between the years of 1982-1987. SERVED.